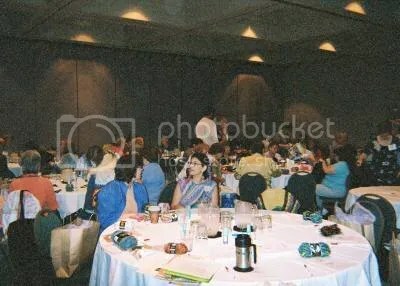 >Chain Link, the annual seminar of the Crochet Guild of America was fantastic this year. Professional Development Day, which starts the day before Chain Link officially opens, was a huge success this year and incredibly fun, as it as always been in the past for me. I arrived in Oakland the day before PPD, in order to help Darla Fanton prepare and set up for PPD, which started at 8:30am the next morning. True to form, Darla had already packed most of the 80+ goodie bags that we needed for the participants! And boy, were those incredible goodie bags this year for everyone who attended! We had so many last minute signups, we ran out of goodie bags, and right before we started, I was running around like crazy, trying to find a seat for all the latecomers. We even had to have the hotel staff add an extra table in the end! It was an inter-active presentation, that we all got to use crayons, markers, and noisemakers. 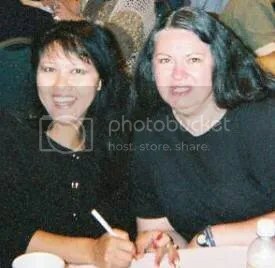 Here is a photo of Noreen and myself after PPD was over. You might be able to see that I was wearing the ‘ponchini’ that I had made specifically for PPD. Unfortunately, photos don’t do our crochet work any justice, BUT, Lily Chin liked it and the ‘look’ so much, she asked me to model in the Fashion Show Breakfast on Friday morning. 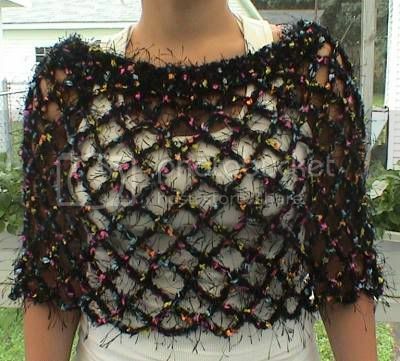 One of the items I modelled was a beautiful poncho made by Carolyn of Skein Lane that was knit from an Oat Couture pattern. Unfortunately, none of the pictures that were taken of the garments that I modelled, came out. After lunch, the ‘breakout sessions’ that were presented were fabulous. Everyone was instructed to pick three topics they were interested in. Each presenter would speak at their table, on their topic for 1 hour. I chose to participate in Designing For the Runway, presented by Nancy Nehring; The Internet Made Easy presented by Kim Werker of Crochet Me; and Meet The Press presented by Lily Chin. Each of these topics were quite impressive and carried a wealth of information! I learned alot from each one of the presenters. They each deserved an A+ for the time and effort devoted to their presentation. The nice thing about the afternoon, is that we were able to get handouts from each topic that was presented. A huge thank you goes to Darla Fanton for her year-long work devoted to making Professional Development Day such a huge success this year! 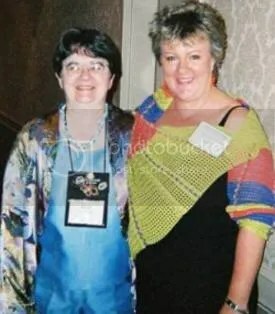 Darla is shown below with beloved Australian designer Jenny King. One of the fun things about PPD and Chain Link in general, is seeing all the beautiful crochet garments that designers, editors, and crochet enthusiasts alike wear all over the hotel and everywhere! 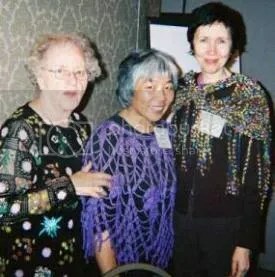 Below you can see renowned publisher Rita Weiss, well-known designer Doris Chan (now known for her “Coming Home” ‘Martha’ poncho on the Lion Brand website) and Susan Haviland, Design Editor for Lion Brand Yarn Company, all decked out in their crochet finery! During the course of the rest of the week at Chain Link, I was lucky enough to take four crochet classes. This was a first time venture for me! Usually I was either teaching classes myself or working the Fiber Arts Market with a Vendor Booth. 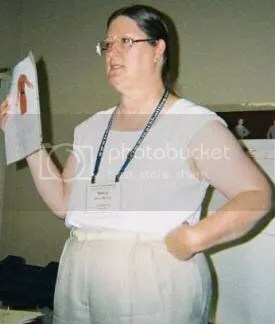 The first three classes I took were design classes given by Nancy Nehring (see photo below). They were a series of classes based on a wonderful set of Paper Dolls Nancy has designed herself. The classes were incredible and I learned alot! I would highly recommend them. My last class on Sunday afternoon was with Lily Chin. I had never taken a class with Lily before, and I was not disappointed! 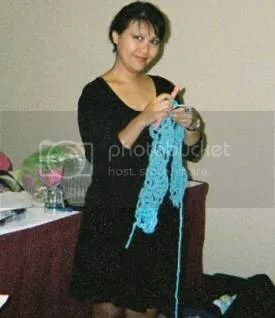 As you can see from the picture below of Lily teaching, when she is instructing, she uses a large Q-hook and very large yarn, so that even the people in the back of the room can see what she is demonstrating. I had been told to come to any of Lily’s classes very well rested and ready to receive an incredible amount of information, and that is exactly what I got! We have many local crochet guilds who come to Chain Link as large groups. 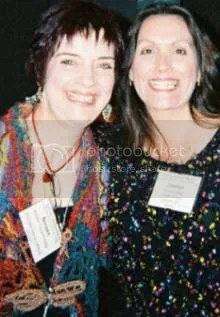 Lily and Barbara are both members of the New York City Crochet Guild. So much goes on at Chain Link, I could not possibly begin to tell you all about it here! Yes, there was a huge Vendor Fiber Arts Market full of yarn, patterns and all sorts of crochet and knitting goodies! I will show photos of the few things I bought later! I did not take any pictures of the Fiber Arts Market, although I know there are other people that do, because when I was a vendor, we were specifically told it was against regulations to take any photos of anyone else’s booths or setups for copyright reasons. So I had to refrain from taking any photographs to post here! Visit the CGOA website to find out all the details! Chain Link, the annual seminar of the Crochet Guild of America was fantastic this year. Professional Development Day, which starts the day before Chain Link officially opens, was a huge success this year and incredibly fun, as it as always been in the past for me. I arrived in Oakland the day before PPD, in order to help Darla Fanton prepare and set up for PPD, which started at 8:30am the next morning. True to form, Darla had already packed most of the 80+ goodie bags that we needed for the participants! >I was literally in the middle of posting about CGOA Chain Link, when I was tagged by Tara of Coffee Crochet. And who better to be tagged by, then a fellow coffee lover! id•i•o•syn•cra•sy – a structural or behavioral characteristic peculiar to an individual or group. Write down five of yours. 1. I not only drink my coffee black, but I usually put an ice cube in it to cool it off before I drink it. 2. I crochet left handed and knit right handed. 3. If my family would allow it, I would play Christmas music all year round. As it is, I start playing it the day after Thanksgiving, and don’t stop until after January 6, which is the Italian ‘little Christmas’. 4. I wear black most of the time, all year round, no matter what the occasion. 5. I am a perfectionist and spend hours correcting crochet designs, patterns, letters, webpages, and most things I do, including blog posts! I was literally in the middle of posting about CGOA Chain Link, when I was tagged by Tara of Coffee Crochet. And who better to be tagged by, then a fellow coffee lover! >Thanks for all the nice compliments about my Seraphina Shawl! I can’t wait to give it to Cristina for her birthday. I am not sure the yarn is going to be available at Joann’s anymore with the tonal coloring. When I was last at Joann’s the Rainbow Boucle they had for sale did not have the tonal coloring to it; it was just a normal boucle. For this Shawl, I used about 9 oz. of the Rainbow Boucle; (it is an 11 oz. skein). I used a J hook and it had 15 shells on each side of the center shell when I ended it. I also sc’d across the bottom of the last row of shells. Angela thinks it made a perfect size!